The rise of the smartphone has disrupted traditional shopping patterns in ways few thought likely as little as five years ago. Now, in these days of 24/7 connected shoppers, retailers don’t need to keep up with their competitors as much as they do their customers. We set out to answer the question of how women shop today in two recent national surveys,* asking this critical demographic group how they discover, filter and buy. 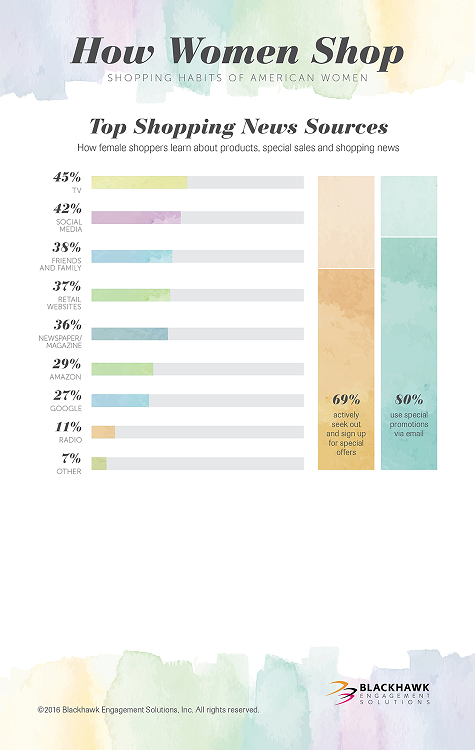 The results show that female shoppers are connected, very well-informed and are prepared to make a thoughtful, considered purchase anytime and anywhere. This has some implications for the payments industry. Price is the primary shopping decision factor. Female shoppers left no mystery as to what’s most important when they make shopping decisions. Almost all respondents said they’re as sensitive or more sensitive to price as they were the previous year, and nearly as many have the same or less shopping power. This creates the playing field for putting the smartphone to its most effective shopping use: quickly tracking down information and finding the optimal balance of price and quality. Additionally, the majority of respondents find rebates attractive on and offline, and redeem them on their smartphones. They like the value rebates bring as well as the convenience smartphone redemption has added to the process. The endangered wallet. 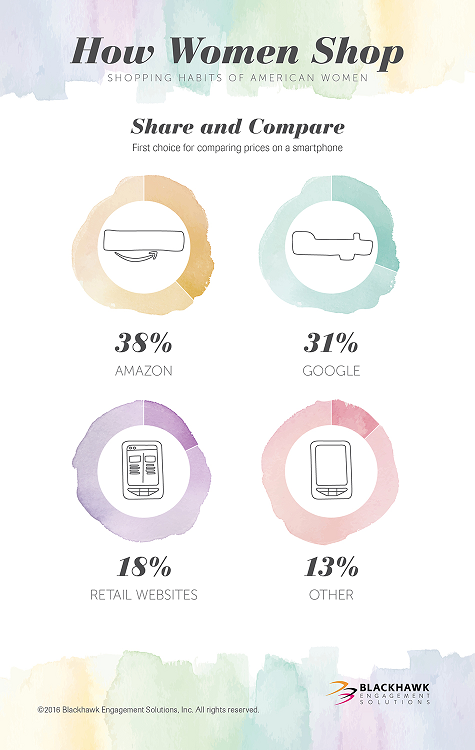 Smartphones excel at comparing prices, and female shoppers use Google and Amazon to comparison shop most often. Almost one-third of those surveyed use a payment app, with PayPal heading the list by a great margin. But more than half of those surveyed would use a mobile wallet exclusively, if it included everything they need. Gift cards maintain popularity. Female shoppers continue to find safety, flexibility and value in gift cards, with a large majority purchasing them in the past year, including for themselves. Seventy percent would use gift cards when exclusive values are attached, and 54 percent would buy gift cards that can be converted to electronic cards. Of particular interest, well over half of female shoppers surveyed believe gift cards are better for limiting identity fraud and are safer for online transactions than other digital payments. Universal appeal. Female shoppers enjoy the wide choice provided by universal prepaid cards. For a post-purchase incentive, our respondents would choose a $25 open-loop prepaid card over an Amazon gift card, a card for the store where the purchase was made, or even a Google Play or iTunes gift cards for the same amount, generally by a 2:1 margin. The open-loop prepaid card is preferred even more than a store card of greater value. Shopping apps not all that. Smartphones have ushered in an avalanche of shopping apps, but actual use of them hasn’t followed. Nearly three-quarters of female shoppers surveyed use Amazon, but thereafter app use declines sharply, with grocery store apps second at only 28 percent. Major retailers reside in the teens and single digits, and other than Groupon and RetailMeNot, use of third-party savings apps is negligible. Plastic vs. electronic payments. Digital age or not, the women we surveyed still emphatically prefer plastic prepaid cards over e-codes as post-purchase rewards for typical denominations. When e-codes are the only rewards offered, acceptance is high but declines as the purchase amount increases. For example, 80 percent will accept the offer of a $25 e-code on a $100 purchase if it’s the only option, but only 60 percent will take a $300 e-code on a $1,200 purchase. Plastic in hand is easier to spend for larger amounts, and less likely to be misplaced or overlooked. The above preferences and trends are key for those looking to attract the buying power of female shoppers. And, while digital reward use will grow, those who can combine everything women shoppers want—coupons, rebates, digital and plastic options, comparison shopping and the best prices—will win. Rodney Mason is group vice president of marketing at Blackhawk Engagement Solutions. He may be reached at Rodney.Mason@bhengagement.com or follow him on twitter at @rodmoose. The How Women Shop Study. The How Women Shop data was extrapolated from a shopping survey conducted by the Blackhawk Engagement Solutions marketing team in April 2015. This survey had a total of 2,609 respondents and was reflective of the U.S. population in respect to age, gender, income and ethnicity. After filtering results and cross-tabbing the survey results, our team found that there were statistically significant differences between male and female shopping habits from the questions conducted. From this data, we focused on female respondents and the most relevant questions that provided interesting and relevant insights. There are a total of 1,327 female responses in this study. According to the U.S. Census Bureau, at the end of 2015, the estimated U.S. female population was 165,311,598. Given the survey sample size, the margin of error would be +/-3%. The Shopping Apps Study. The Shopping Apps Study is an Internet-based survey conducted by Blackhawk Engagement Solutions from Oct. 26- 30, 2015. The sample size of 1,354 American female respondents, ages 18+ at the 95 percent confidence level would equate to +/-3 percent margin of error had this been a random sample.